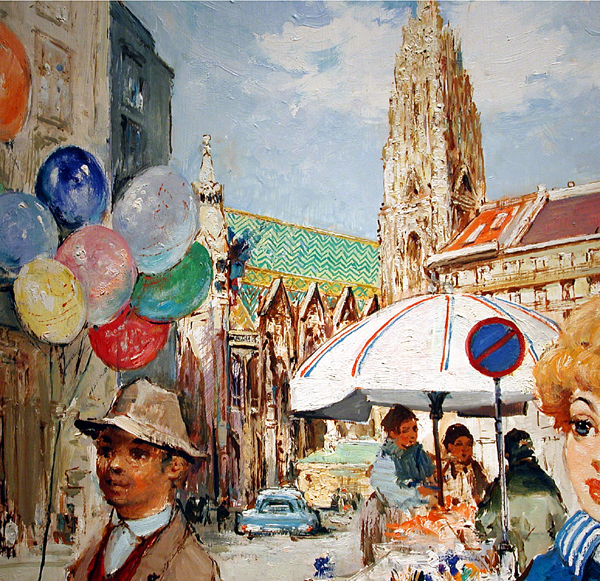 Beautiful, almost impressionist portrait of a young girls the central place of Kenna, Stephansplatz with view of St.Stephan Cathedral in the background. This oil painting was executed in 1950s by listed Hungarian-French painter Antal Jancsek, active in Paris,Vienna and Budapest in the 1930-50s. The artist was born in Budapest and studied under Oskar Glatz and Janos Vaszary. The artist exhibited his works at the Salon in 1932. Jancsek has developed a very personal, easily recognazable style. Literature: Dr. Szabo-Kallai " Dictionary of Hungarian painters"; Budapest,1997;General Artist Lexicon (in German: AKL ) by Saur.